Kenya is where it all began. This was our first test market and has continued to be the leader in partnership development across all key stakeholder groups. 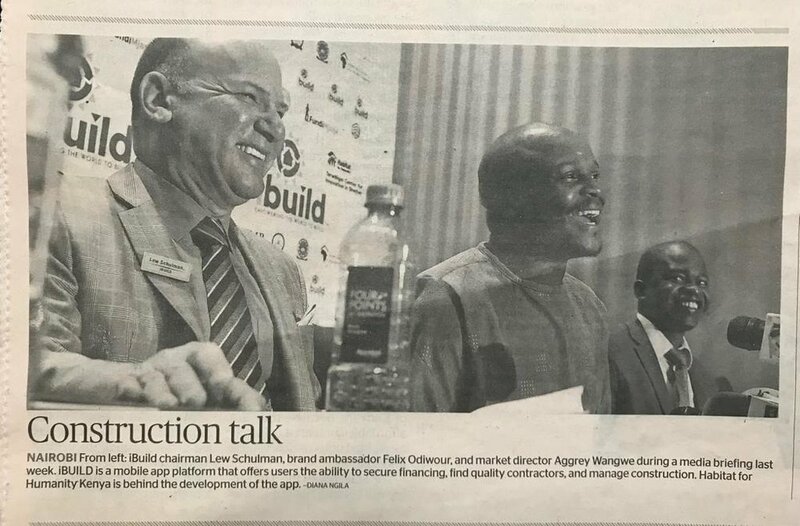 iBUILD Kenya's staff of country-level Ambassadors have been instrumental in rolling out the iBUILD platform with key partners and stakeholders across the entire housing construction eco-system. The ambassador role is at the heartbeat of iBUILD's customer experience strategy and their knowledge of the construction industry uniquely equips them to communicate the benefits and efficiently expand our market presence. 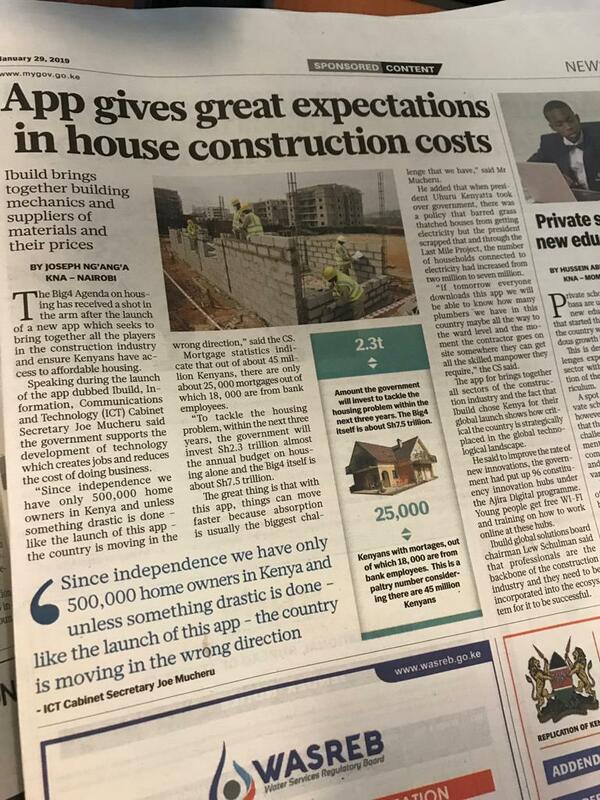 The Kenyan team is working with customers, key stakeholders and market partners alike, building a powerful platform to ignite citizen initiated construction, addressing individual housing needs for all. Our relationships with Habitat for Humanity International, KFMB, KETRB and JKUAT School of Architecture have been instrumental in growing the Kenyan user base and establishing iBUILD with key stakeholders across the entire construction value chain. iBUILD has entered India in partnership with Mahindra Rural Housing Finance Limited, headquartered in Mumbai. The iBUILD lender module is a key attribute of the iBUILD Global platform and provides Mahindra access to an innovative technology for their customers to hire skilled contractors, artisans and laborers and to locate and place orders with reliable suppliers-all through a single virtually accessible platform. iBUILD allows select Mahindra customers to manage their financed projects and payments for whole house construction, incremental construction and critical repair. The iBUILD direct communication feature allows real-time chat with participating parties throughout the construction process, including lender, contractor, artisans and suppliers. The South African market is complex and storied, yet ripe with opportunity and a vibrant culture of innovation with widespread adoption of mobile technology. iBUILD Global has partnered with Sofala Capital and IBUILD Home Loans, to launch iBUILD in Cape Town, South Africa Q2 2019. The integration of the iBUILD mobile platform into Sofala's iBuild Home Loans business processes allows their customers to receive virtual loan disbursements for their home construction projects via the iBUILD application. The iBUILD platform will enable IHL customers to search, hire and pay skilled contractors and artisans as well as purchase supplies and keep a record of all transactions across the life of the project. iBUILD and Sofala Capital will provide the kind of powerful partnership that South Africa needs to equip the masses to meet their unique individual housing needs through individualized home construction projects. The iBUILD platform will connect a vibrant construction value chain and ignite capacity to scale affordable housing construction and close the swelling gap in the nation's affordable housing inventory. iBUILD has recently entered Nigeria and has established a joint venture partnership for West Africa. Like most countries, the Nigerian housing demand is vastly higher than what is being built; most outstanding in Nigeria however, is the shear size of their population and the growing demand for housing that is affordable for the majority. iBUILD is the perfect solution for activating the construction marketplace and creating a new ecosystem of connectivity and transparency across the entire supply chain: lenders, developers, architects, contractors, workers and suppliers are all important stakeholders in the ecosystem. Growing capacity of the workforce and ensuring all skillsets are proportionately represented will maximize large scale housing construction output while at the same time, activating a groundswell of activity at the citizen level; creating a massive number of individual housing construction projects and creating many more jobs than were available before. iBUILD is collaborating with multiple government ministries in Indonesia as well as The World Bank, large scale housing developers and banking institutions. In a country that is committed to addressing the affordable housing crisis, they intend to have full traceability of all subsidies going through federal housing programs so that all funds are spent for their intended purpose. iBUILD brings increased accountability, efficiency and expediency when the ecosystem has the interconnectivity they need to transact together on a single platform and collaborate across all stakeholders, sharing project details in a moments notice, all through a mobile app. iBUILD Data & Analytics will play a large role in helping government to understand individual housing demand, the construction marketplace and the strengths and weaknesses of the housing construction value chain. Focusing economic and investment resources based on real data will direct strategic placement of funds to render the highest impact on productivity and housing supply.